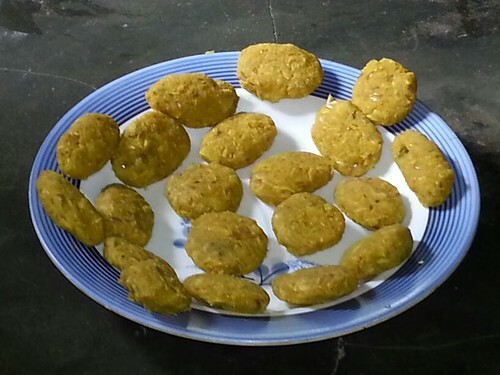 Mutta Chikkiyathu is one of the simple foods from Kerala, India which is made from scrambled eggs which are cooked plain or with usually chopped onions and salt and pepper to taste. 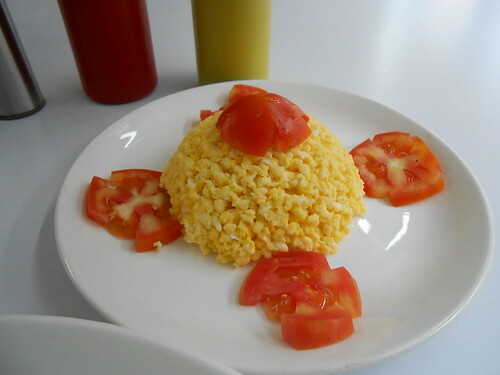 Scrambled eggs are basically the eggs that are stirred when cooked and without any added ingredients on it. 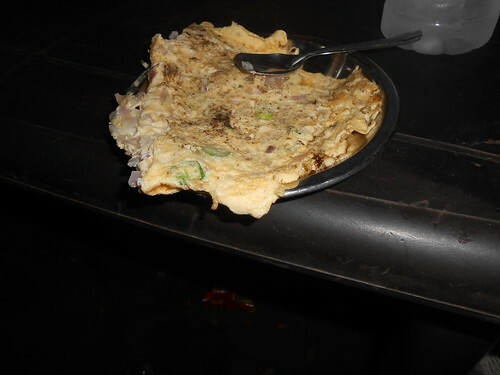 In Kerala, India, they call Mutta Chikkiyathu (scrambled eggs) an Omelette when they are cooked with chopped onions, usually and some spices, and salt and cooked like Pancakes, flipped like Pancakes and looked like Pancakes. 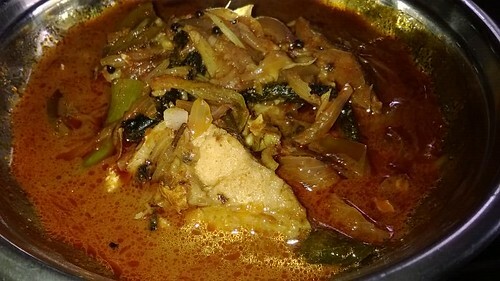 Meen Porichathu also commonly called as Fish Fry is one of the popular dishes from Kerala, India which is simply fried fish which is made special by coating or marinating the cleaned fresh pieces of fish in Masala powder , then deep fry in coconut oil until they are crispy. 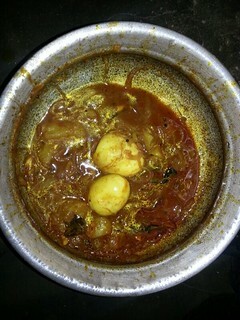 Coconut oil which is the favored oil for cooking by the Malayalees is the secret of delicious dishes in Kerala, India. 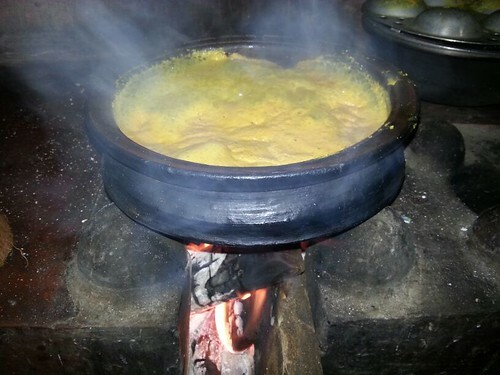 Please enjoy the pictures of Fish Fry made in Allepey, Kerala, India. Coating the cleaned whole piece of Tuna with Masala powder first for some time before frying in Coconut oil gives the Keralite Fish Fry its distinct tasty flavor. 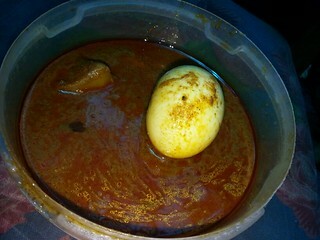 Below is one of the special Fish Fry "fit for a Prince". 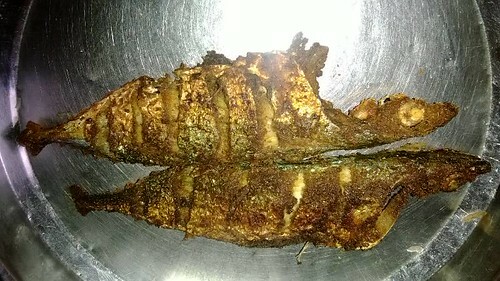 A Karimeen Fry made from fried Pearl Spot. 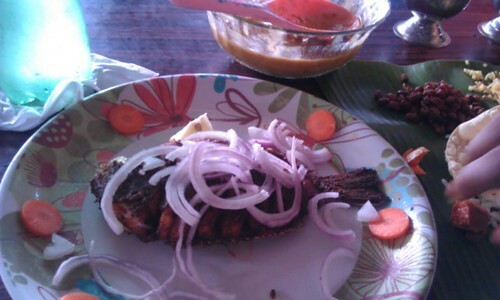 This is a delicious meal of Karimeen Fry served with salad of raw sweet red onions on top. 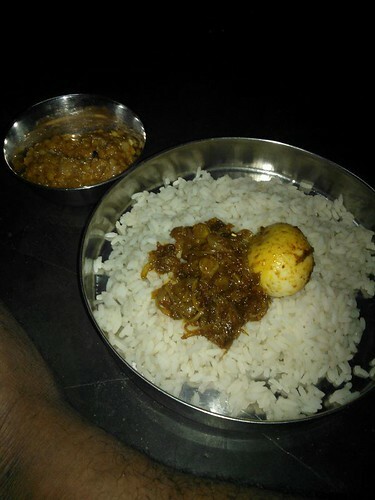 Prince Charles of England ate what I have eaten in Kerala, India after a wonderful and quiet boat tour of the Backwater of Allepey. 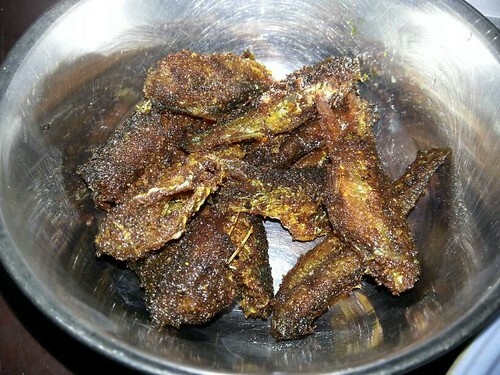 Karimeen (Pearl spot fish) fry is a sought after delicacy in Kerala. 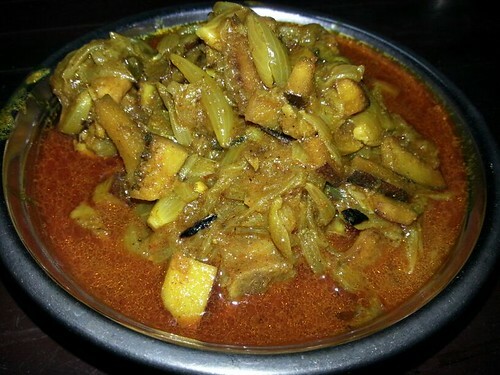 The Pearl Spot fish is marinated in a mixture of lemon juice, red chillies, and other spices and Masala Powder, too and and deep fried until crisp and golden brown. 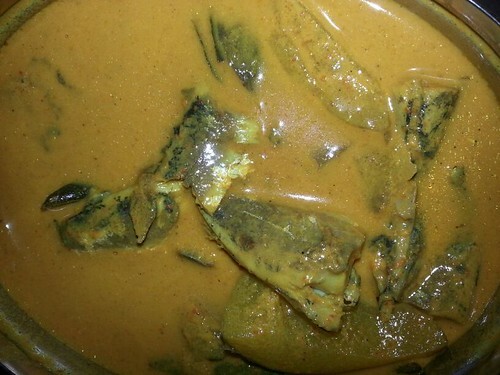 This is an exotic dish of Karimeen fry cooked Kerala style. 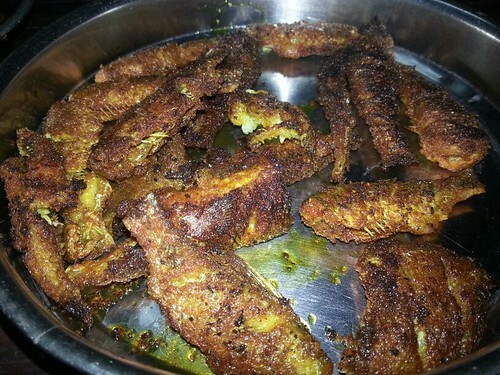 The Karimeen fry is a spicy fried fish coated with the delicious and spicy Masala. 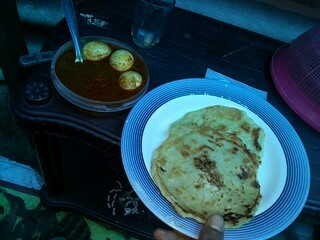 More pictures below of different kinds of Meen Curry cooked by my hosts in Allepey, Kerala, India. 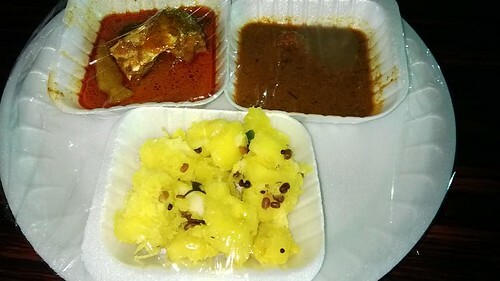 Below is a set of meal being sold during the Trivandrum, Kerala Food Festival during the Christmas season. 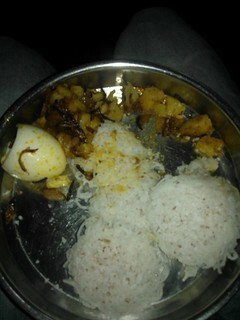 The set includes Kappa Puzhukku (boiled Cassava), Rasam and Meen Curry. 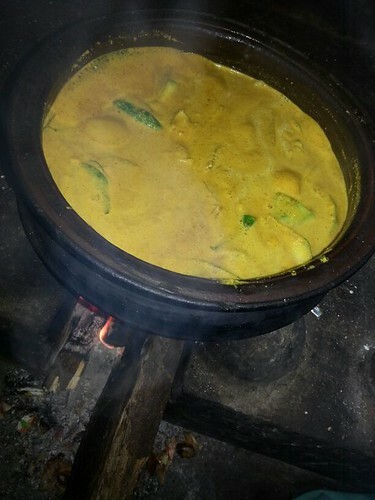 Next two (2) pictures are Mathi Curry / Fish/Meen Curry cooking in the traditional pot for cooking curry called Manchatti / Meenchatti / Manchatty. 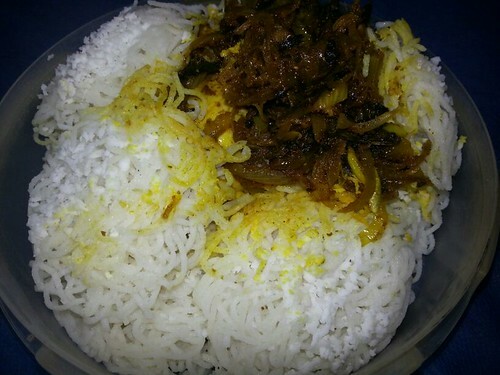 Mathi/Chaala is Malayalam for Sardine.